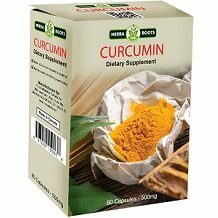 Today we are reviewing Pure Herba Roots Curcumin. This is a dietary supplement claimed by the manufacturer to prevent and treat a broad range of health conditions, including arthritis, diabetes and heart disease, as well as protect against infections and promote digestive and cognitive health. The main ingredient used in the product is Turmeric Root Extract (95% Curcuminoids). Lacking in the ingredients is black pepper extract which can help in the absorption of the turmeric curcumin. The ingredients appear vegetarian and therefore suitable for vegetarians and vegans. The product contains Turmeric Root Extract with a 95% Curcuminoids concentration which is high compared to competing brands of turmeric. Take 1 capsule, twice per day with meals and a glass of water. The manufacturer does not state the best time of day to consume the product. The product label recommends that you consult with your doctor prior to using this supplement. Do not use if pregnant, or nursing. Discontinue use 2 weeks prior to surgery. It is unclear if this supplement is suitable for people under age 18. On the manufacturer’s website, one 60 count bottle of capsules costs $34.95 with free shipping. At a 2 capsules daily dose, this is enough for one month’s supply. There is no bulk buying discount nor new customer incentive offered by the manufacturer. The manufacturer offers a 30 day return policy on unopened products only. You are responsible for return shipping costs. The positive aspects about this product are that it is manufactured in a FDA and GMP certified facility, and certified USDA organic. The ingredients appear vegetarian and therefore suitable for vegetarians and vegans. The product contains Turmeric Root Extract with a 95% Curcuminoids concentration which is high compared to competing brands of turmeric. The manufacturer offers a 30 day return policy. Standard order shipping is free when you spend over $20, and $5.99 if under spending under $20. We have a number of negative comments too however. Lacking in the ingredients is black pepper extract which can help in the absorption of the turmeric curcumin. Regarding dosage instructions, the manufacturer does not state the best time of day to consume the product. This supplement is costly at $34.95 and doesn’t come with bulk buying discounts, nor a first time buyer incentive. The manufacturer’s return policy is short at 30 days and only applies to unopened products, and return shipping is your responsibility. There was no explanation on the manufacturer’s website regarding how long you should take this supplement for, how long it takes to see health benefits, nor how to measure these benefits. The consumer reviews that we read indicated that many consumers failed to see any significant health benefits when using this supplement. We recommend that you only purchase a turmeric supplement with a lengthy return policy, that is good value for money, and backed by positive consumer reviews.